Maritime Security in Northeast Asia has been a common topic of conversation for a while now, and with recent escalations in the naval arms race, the North Korean threat to South Korea seems more real than ever. In the midst of the looming possibility of war, the people of Jeju find it difficult to accept their land’s fate as the new home of a large naval base. The South Korean government approved construction of the naval base in May of 2009, although talk about the issue started in the early 1990’s. Due to resistance, however, little development has been done. The majority of the people on the island agreed with the central government that a base was needed, just no one could agree where, until now. Actually, not everyone has agreed. Those able to force the issue have. Eugene Craig Campbell lives near Gangjeong, the proposed site of the base, and frequently visits the beautiful shoreline area. Campbell also said he has grown to trust Koreans and their insight. After all, this, Gangjeong village, is where he has made his home. Campbell said although his feelings regard NIMBY, the idea itself is harmful to the greater good. Many of the people of Gangjeong have been adamantly against the base since realizing their village’s destiny as its new home. Protesters shaved their heads, cried, and pleaded for reconsideration. Several protesters were taken to jail and accused the police of brutality. The Environmental News Service reported that a 70-year-old man hit his head on a rock after being pushed by police officers. When the newly-elected Governor Woo Keun Min came into office on July 1, he halted construction due to unresolved issues. This was considered another setback for base development after the Seoul Administrative Court rejected a lawsuit by the village claiming the Ministry of Defense approved construction without completing an environmental impact study. The results of a final vote in Gangjeong, however, showed that 62 percent of eligible voters chose to accept the proposal unless another location chose to house the base. Bruce Gagnon is coordinator of the Global Network Against Weapons & Nuclear Power in Space. He and several other representatives opposed to the base visited the island to express concern at a panel held in early 2010 by the Gangjeong residents. The panel consisted of individuals from Guam, the Philippines, and Okinawa, all locations affected by naval base construction. “When we were out on the coast today and the mayor was showing us the pictures of the fish and the coral, he was crying. You know, they are not just fighting for their land to grow tangerines, not for just their way of life but they are fighting for the fish, for the coral, for the rocks, a kind of depth of consciousness that I have seen very few times in life as an organizer,” said Gagnon. Jeju is the only place in the world to achieve UNESCO “triple crown status” because of its remarkable geography. 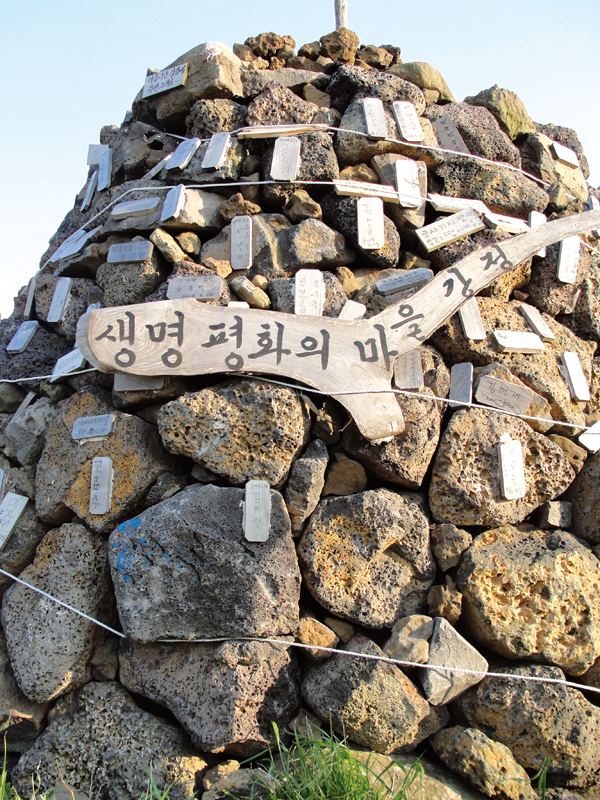 The former Roh Moo Hyun government also designated Jeju a “peace island” as a form of apology for the April 3rd 1948 Massacre. Gangjeong village leader, Kang Dong Kyun said at the panel that bringing the base to the village would make the island a target if there were ever a conflict and that the notion of a base here negates the idea of an island of peace. Kang went on a 14-day hunger strike in protest. Kim Myung Yeo is a 43-year-old Jeju resident. He said he is in favor of a naval presence on the island for development opportunities and military strategy, but only if the location is agreed on by everyone. “Those in charge of bringing the naval base here must follow the will of the citizens and avoid destroying the environment,” said Kim. Kim also said he would not want a US military presence on the island. “It’s important to know that the US has recognized that it can’t compete with China economically anymore, but the theory is that if you can control their access to oil then you will hold the key to their economic engine, and thus be able to manage or control China. And so as it turns out, China imports 80 percent of its oil via ships, right along, guess where — the sea way just between China and Jeju Island,” said Gangnon. Jeju is in the center of Northeast Asia, which gives the island a political and geographic advantage. To the east, the island faces Tsushima Island and the Japanese territory of Janggi. To the west, Jeju faces Shanghai across the East China Sea. The South China Sea lies south of the island while mainland South Korea lies to the north. The naval base built on Jeju was earmarked for 97.5 billion won, or $86 million. The new base will be home to up to 20 Aegis destroyer warships. The Korea Times reports that the Aegis combat system, built by Lockheed Martin, is the world’s premier surface-to-air and fire-control system, capable of conducting simultaneous operations against aircraft, ballistic and cruise missiles, ships and submarines. Only a handful of countries, including the United States, Spain, Japan, South Korea and Norway, deploy Aegis warships. United States Forces Korea denied comment, stating that the base was South Korean and all questions should be directed towards the ROK Ministry of National Defense, who also denied comment. Eugene Campbell worked 13 years at the Korea Institute for Defense Analyses in Seoul and six years for the Korea Institute of National Unification. He said the purpose of Korean blue-water naval capability is not to oppose China but to help protect Korea’s vital sea lanes coming in from the Middle East. “Washington has long been demanding Japan and Korea to take their fair share of responsibility for that,” said Campbell. He denied Gagnon's theories. Governor Woo said in November that he had considered the concerned parties and is now on board with the central government’s chosen site in Gangjeong. However, on Dec. 22, the proposed date to begin construction, 34 protesters including priests, citizens, and local politicians were arrested on site in an attempt to stop construction. The protesters were held for 12 hours and then released. Sung Hee Choi represents the Gangjeong villagers resisting the base. She said that although the decision has been made and their voices may seem weak, the struggle is still real.